Cognition involving others, or social cognition, is often conceptualized as the soli- tary, third-person computation of mental states. Relatively, little attention has been paid to how individuals use their cognitive capacities at the behavioral and brain levels in social exchanges. We introduce imitation as a valuable model of dynamic social interactive phenomena and describe laboratory procedures for studying it in behavioral and neuroimaging contexts. We review research that reveals behavioral and neural synchronization of individuals engaged in imitation. 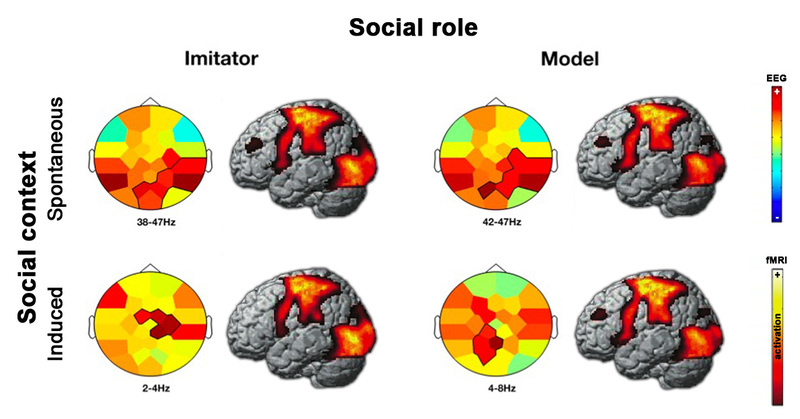 In the latter case, brain activity is correlated in imitative partners, but the pattern expressed by an individual depends on the individual’s role (i.e., model or imitator). We link these find- ings to theoretical notions about mirroring and mentalizing brain systems and then describe how mirroring and mentalizing support the notion of prospective cognition, even in basic forms of communication such as reciprocal imitation.